Sterling Highway milepost 44.9—turn south on Quartz Creek Road near the Sunrise Inn. The campground is on the right next to Kenai Lake. The road crosses the creek .8 miles ahead and reaches Crescent Creek Campground at milepost 3.3. 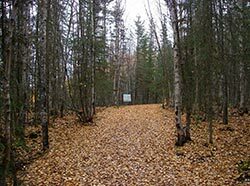 The road provides a long edge habitat with alders, and mixed white spruce and paper birch forest. The Pothole Lake Fire Overlook at milepost 2.5 offers a view of an 8,700-acre region swept by wildfire in 1991, now a vast slope of young alder and willow. Lower and Upper Skilak Lake campgrounds provide popular boat launching sites for people fishing the inlet and outlet of the Kenai River. The road is well-traveled by fishermen and tourists to access fishing, campgrounds, trails, and wildlife viewing. In summer, listen for the loud, whistled “quick—three beers!” song of olive-sided flycatchers at Rock Lake near milepost 6. In early spring, listen for the hoots of great horned owls. To maximize your chances of seeing wildlife and avoiding traffic, drive the road slowly at 10 to 15 mph early in the day (before boaters start driving the road with trailers), or late in the evening. If you hike, go during daylight hours, with company, and be bear aware. Skilak Lake Road runs for 19 miles, with entrances at Sterling Highway mileposts 58 and 75.2. Kenai National Wildlife Refuge Visitor Contact Station at Sterling Highway milepost 57.8; stop for refuge information, June 10—August 15, 10am to 4pm daily.